It’s likely that all of you have encountered people who constantly do their best to persuade others to have a drink – drink pushers. For the longest time, I was one… But when I took a break from drinking, I absolutely hated to be around drink pushers – mainly because I didn’t know how to deal with them. 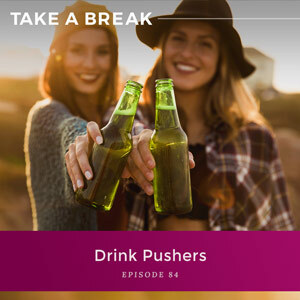 On this episode, we explore why people are drink pushers and why we avoid them and blame them for our own choices around drinking. We also look at what we need to understand about the think-feel-act cycle and how it’s driving the action of pushing other people to drink. Join me to discover how to handle the situations where someone is trying to persuade you to drink to help you feel empowered rather than pressured. Visit www.rachelhart.com/urge to find out how to claim your free meditations, plus a brand new workbook that will teach you a different way to respond to the urge to drink. Why some people like to persuade others to drink. The worst thing you can do when you encounter a drink pusher. What really affects how you feel and act around a drink pusher. How you can apply the think-feel-act cycle to situations when someone is pressuring you to drink. What you can do when someone is pushing you to drink and feel empowered as a result. Visit www.rachelhart.com/urge to find out how to claim your free Urge meditations and brand new workbook. You are listening to the Take A Break podcast with Rachel Hart, episode 84.Welcome to the Take A Break podcast with Rachel Hart. If you are an alcoholic or an addict, this is not the show for you, but if you are someone who has a highly functioning life, doing very well, but just drinking a bit too much and wants to take a break, then welcome to the show. Let’s get started. Welcome back everybody. We’re talking about drink pushers today. People who push you to drink. I’m sure probably all of you have encountered someone like this, and you know what, I know a lot about this topic, I have a lot of first-hand knowledge because I was one. I was a drink pusher. I was always pushing people, cajoling people, persuading people to drink with me. And when I wanted to change the habit, I hated being around people like me. I hated being around other fellow drink pushers because I didn’t know how to handle it. And I thought that they made me feel terrible about my decision not to drink. So it was this fascinating thing that for a long time I could see myself because I flip flopped back and forth for so many years trying to figure out my drinking. So I was and I wasn’t, I was and I wasn’t. And I was a drink pusher and then I hated being around them. Then I’d go back to being a drink pusher and then I hated being around them. And it’s so fascinating now because now, well of course, I’m not a drink pusher. But it’s so fascinating now understanding the think-feel-act cycle and all these tools that now I can watch people who are and have such a different understanding and such a different perspective on what is happening. So here’s the thing: you may be a drink pusher, maybe you’re not. If you are, don’t worry. It’s okay. It doesn’t mean you’re a bad person. It actually is a fantastic opportunity to understand how your own think-feel-act cycle is working. And if you’re not, that’s okay too. But what I want all of you to take away from this is that when you are trying to change the habit, the worst thing that you can do is encounter a drink pusher, someone like I used to be, and fall into the trap of wanting to hide, wanting to blame, wanting to avoid. Remember, the work that we are doing here, the work to change the habit in a sustainable way, a long-lasting way is not the work of isolating and is also not the work of focusing how everyone around us makes it so difficult not to drink. It is the work of really understanding how our own thoughts, our own feelings are driving the action of drinking. And yes, you will encounter other people along the way. But guess what? This is why these tools are so powerful. You can apply them, you can understand the think-feel-act cycle for other people as well. So you can get out of the habit of hiding and blaming and avoiding, because that will not create sustainable change for you. So today what we’re going to do, we’re going to talk about why people are drink pushers, why we alternatively blame and then avoid them for our own choices around drinking, what we need to understand about the think-feel-act cycle and how it is driving the action of pushing other people to drink. Because listen, if you are trying to persuade other people to drink or you encounter other people who are doing this, that is an action that we can all understand in the cycle and how to handle being in these situations so you can feel empowered. So I want you to think about a time when you encountered someone who wanted you to drink. And just think back. What did they say? “Oh, it’s my birthday, don’t make me drink by myself. Come on, don’t be a buzzkill, one won’t hurt.” What did they say when they were trying to get you to drink? Here’s the thing: it is so fascinating to listen to what drink pushers say because often once you start paying attention and once you start doing the work of understanding how your own habit works, you will notice how similar their excuses are to the excuses that you use with yourself. I mean, really think about this. How many times have you told yourself, “It’s a party, everyone else is, I don’t want to be a buzz-kill, one won’t hurt,” right? How many times have you had these thoughts which created desire or permission and then gone on to have a drink? And so in many ways when we listen to a drink pusher and we’re curious about what’s going on, we start to see like, hey, their language, what they’re saying kind of sounds similar to some of the things I say to myself. Now, here’s the difference. I want you to think about you have this person in mind, someone who’s wanted you to drink and you have in mind what they said to you, what was their persuasion that they attempted with you. So you have this in mind but I want you to now think about okay, so what happened when you encountered the words that the drink pusher was saying to you? Most people will say, well it felt terrible. I was embarrassed, I felt guilty, I was annoyed, I was frustrated, I was angry, I felt awkward. So most people will list a lot of feelings, or they’ll list a bunch of actions. When that person said those words to me, I wanted to hide, I wanted to avoid them, I caved, I gave in, I made excuses. So what will happen is we encounter the words that a drink pusher says and what we tell ourselves happens is it creates a whole host of negative emotions, feelings, or it creates a whole host of actions. But remember, that is not how the think-feel-act cycle. This is a really important piece. Your feelings, your actions are never created by other people. Really want you to hear this again because this is something that for most of us we really have to wrap our mind around. Your feelings, your actions are never created by other people. They are created by your thoughts about what other people are doing or saying. And that is a huge distinction, and it’s a distinction that for a very long time in my life I did not understand and it is a distinction that I work on with my clients all the time. Because when they start out using the tools, they don’t understand this either. They say, “No, no, no, this person made me feel this way.” “No, no, no, this person made me do this thing.” It does not work that way. That is not how the think-feel-act cycle works. And this distinction is everything because if how you feel and how you act is created by a drink pusher, well, then you have no choice but to either avoid them at all costs or focus on blaming them for how they’re responsible for your choice to drink. But if you start doing the work to see how your own think-feel-act cycle, your own thoughts is driving how you feel and act, well then, my friend, you’ve got all your power back. Because all of a sudden, you’re not focused on another person. You get to be focused on yourself. Alright, so let’s review. How you feel and how you act when you’re around a drink pusher is not caused by what the drink pusher is saying but what you are thinking about their words. This is really important. So why is it that so many of us, myself included, I did this for a really long time, blame people who are drink pushers for our own hiding, giving in, feeling angry, feeling annoyed? I’ll tell you why. Because it’s easier. That is really the most simple explanation. It is easier to blame someone else for how you feel and for the decisions that you make than it is to take responsibility for them. Now, the problem is as long as other people are in charge of how we feel and in charge of our decisions, then we have to spend a whole lot of energy trying to get people to behave how we want them to. And guess what? You can take all your time, all your resources, all your energy and devote it to trying to get people to behave a certain way, and I promise you this, you’re not going to be successful. Where you will be successful is if you take that time and energy and resources and devote it to getting and understanding how your thoughts are driving your own feelings and your own actions, and you will be so much more successful. If you want to take responsibility for your own feelings and actions, which I highly suggest that you do because that is really the productive way to create change, you have to start to understand why someone is a drink pusher rather than just blaming and avoiding. And I will tell you, this is actually easier than you might think. All you need to start to do is focus on what their think-feel-act cycle might be. What must they be thinking and feeling that is driving the action of trying to persuade and cajole the people around them to drink. Now listen, I know this is not where your brain automatically goes. My brain did not want to go there either. Your brain is automatically going to what you are making their words mean about you. That is why you’re feeling negative emotion, that is why you’re noticing actions of wanting to blame and or avoid. But what I want you to do is to understand that whatever they are saying to you about drinking means something about them and their think-feel-act cycle, not about you. And by the way, if you’re thinking, “I feel like I could apply this technique to anything that anyone says, not just drink pushers,” you’d be right. That’s why these tools are so great. You will use them to change the habit of drinking, you will use them to understand your own mind and to learn how to manage it, and then you get to use them on everything else in life. Okay, so let’s look at a couple of examples. So I want you to put yourself in the situation of thinking about you’ve made the decision not to drink and then you encounter a drink pusher. So we’re going to look at four different examples and first, what we’ll look at is what your brain is probably making the drink pusher’s words mean about you rather than what they mean about them and their think-feel-act cycle. Or someone could say, “Oh, don’t make me drink by myself. If you’re not having one, I won’t.” Now again, that automatic interpretation, that automatic thought that you might have is, “Oh, I’m going to ruin her time.” That’s the thought that’s probably outside of your awareness. So you feel guilty when you think the thought, “I’m going to ruin her time,” and then when you feel guilty, you may take the action of saying yes. Now again, the guilt that you feel is not being caused by what the drink pusher has said, but the fact that when she says it, your brain interprets it to mean I’m ruining her time. That’s what you’re making the drink pusher’s words mean. Someone might say to you, “Come on, don’t be a buzz-kill, just have a drink.” Again, you might feel annoyed when someone says this. It’s not because of what they said. It’s because of what you’re thinking. And you may be thinking something like, “This guy is such a jerk.” So you feel annoyed, and then what happens when you feel annoyed? You probably get defensive, and then when you feel defensive, you probably are not having a good time. In fact, here’s a hint: you may actually be acting like a buzz-kill. So you could also have someone say to you, “Oh, one won’t hurt.” And again, people will say you know, my friend just kept saying one won’t hurt and then because of her I decided to drink. No, no, no, that’s now how it’s working. Your think-feel-act cycle if you end up drinking after someone says one won’t hurt is probably looking something like this: you have the thought, “Maybe she’s right,” and then you have that feeling of desire, that feeling of permission, and then what do you do? You take the action of having a drink and you strengthen the habit. Now, here’s the thing: you might interpret these situations differently. But I want you to see that there is a thought there. What the drink pusher is saying is not creating what you are feeling or how you are acting. It is the automatic and often very unconscious interpretation that your brain is making. And what your brain is doing is your brain is making those words mean something about you and generally, something negative about you. When that happens, you feel a negative emotion. When you feel a negative emotion, you probably take an action that does not help you change the habit. So that is how your automatic unconscious think-feel-act cycle is at work when you encounter a drink pusher. And in order to do this, you have to start using questions. You have to start asking your brain, “Why are they saying that to me? What must they be thinking? What must be going on in their brain? How must they be feeling?” So again, we can look at these same four examples and start to understand them different. So I don’t know if you’ve ever encountered a really anxious host who cannot enjoy the party because he or she is so fixated on whether or not people are enjoying themselves, but here’s the thing: that could be a think-feel-act cycle that is totally driving what they are saying. So that’s one possibility. Now, if someone says, “Oh, don’t make me drink by myself. If you’re not having one, I won’t.” Again, if you redirect your brain and start to ask, okay, well what must they be feeling if they’re saying this to me, if their action is to say don’t make me drink by myself, if you’re not having one, I won’t? Well, they might be feeling embarrassed. And why might they be feeling embarrassed? Because they may have a thought that they really want to drink but they don’t want to drink on their own. Now, let me tell you, this was something that definitely was going on for me when I was a drink pusher. I would have times when I would meet up with friends for a meal and I was so kind of fixated before like, are we going to get a bottle of wine? Are we going to be drinking tonight? I hope they’re drinking, I want to drink, are they going to drink? I was really fixated, I really wanted to have that drink but I didn’t want it to stand out so it was important to me going into it that they were drinking as well because then I didn’t have to look at my own choices. So that is one potential think-feel-act cycle that could be going on when someone says oh, don’t make me drink by myself. Now, you know, someone could say, “Oh come on, don’t be a buzz-kill. Just have a drink.” Again, what could they be feeling? Well, they could be feeling judged. They could be having that emotion and the thought that could be driving it in their brain is well, drinking makes me more fun, so people who don’t drink aren’t fun. Listen, this was a thought that I had for a really long time. I didn’t understand how to be fun without a drink in my hand. I really didn’t. I had so outsourced fun and entertainment and enjoyment to drinking that when I wasn’t drinking and I was out with people, I wasn’t a lot of fun. So I really truly believed that drinking made people more fun and that if you weren’t drinking you weren’t fun. Now listen, that thought had everything to do with me and nothing to do with the people around me. It was because I had practiced drinking over and over and over again. So the idea of someone not drinking around me at a party or socializing was so foreign to my brain. It really did seem like, well, they won’t be fun. But of course, it was just because of what I had taught my brain. And so I’ll take the action of trying to get other people to drink with me, I’ll try to persuade other people. How do you do that? Oh, tell them one won’t hurt. So here’s the thing, and this is a really important thing to remember. If you feel or if anyone feels uncomfortable about the decision to drink, they’re going to have a lot of judgment not only about what they’re doing but what you are doing as well. If you feel totally secure or if someone else feels totally secure in their decision to drink, they don’t really care what other people are doing. Now, the beauty of this technique is that you don’t have to be right. You don’t have to go up to the drink pusher and confirm like, alright, well, I’m trying to understand your think-feel-act cycle so can you confirm to me that this is what you’re feeling and thinking. No, you don’t have to do that. You just have to teach your brain to start asking questions. You have to learn how to redirect your mind to focus on them, focus on the drink pusher. What must they be thinking and feeling if they’re going around trying to persuade other people to drink? Because if you don’t do that, if left unchecked, your brain will make it mean something negative about you, and it will kick off an unconscious automatic think-feel-act cycle that does not serve you. So when someone is pushing you to drink, convincing you to drink, there’s what they are thinking, what they are feeling that is driving that action of trying to persuade you, and then there’s what you are making it mean, the thoughts you are having that then creates how you feel and how you act around a drink pusher. And let me tell you, if you can parse these pieces out, you get all your power back. Because you can stop hiding, you can stop blaming, and you can just be curious like, what’s going on with them? Asking questions, why are they saying this, what must they be thinking and feeling, asking questions changes everything because all of a sudden, you are forced to show up differently. Suddenly, you can be in a more curious place to understand other people and their brains. And this is how you handle a drink pusher in an empowered way. You don’t run and hide, you don’t blame them after the fact for the decision to drink. You don’t cave. You get curious. Ultimately, the question for you to really consider is why are you deciding to drink. So that people like you? So that people won’t think you’re rude? So that you won’t disappoint anyone? So that people will think you’re fun? That is really the ultimate question that you need to answer for yourself, and it’s very hard to do if you are stuck blaming people and avoiding and hiding people who try to persuade you to drink. Because here’s the problem: even if you make the decision to drink because you think, “Alright, well, if I – I’ll just have this drink because then I can just get this person to stop bothering me and I can avoid having anyone think that I’m not fun or I’m a buzz-kill or I’m rude or maybe the person wouldn’t like me,” if you make your decision to drink for these reasons, you always lose. Because when you change your behavior in an attempt to please a drink pusher, or in fact, when you change your behavior at all to please anyone at all so they will like you, you will lose. Because not even if the person thinks positively about you, they don’t know the real you because you’re not showing up as your authentic self. You’re not doing what you actually want to be doing. What you’re doing is what you think the other person wants you to do. But people pleasing, showing up as others want you to leaves you feeling empty and upset because no one really gets to know the real you. listen, the people who are meant to like you will like you because of who you are and not because of your people pleasing, and certainly not because of the contents of what’s in your glass. And so really, your question is do you want to be you? Do you want to do what you want? Or do you want to be the drink pusher wants you to be? Do you want to focus more on their opinions? I hope that you choose that you want to be you. You want to show up with what you want to do. But in order to do that, you cannot hide and blame. You have to understand, if someone’s trying to persuade you to drink, they have a whole think-feel-act cycle going on that if you can try to understand it, that will make all the difference for you. Alright, not a drink pusher anymore. I’m really glad about that. And guys listen, if you find that you are doing this as well, it’s okay, you just need to understand your own think-feel-act cycle and the more you do, the more you’ll be able to understand when you encounter people like this. It really is an opportunity for you to get curious about how the brain is working as opposed to avoiding and isolating and blaming. Alright, want to hear me talk about anything on the podcast? Just shoot me an email at podcast@rachelhart.com. Otherwise, I will see you next week. Hey guys, if you’re finding this podcast helpful, and I really hope you are, I would love if you head on over to iTunes and leave a review. And as a special thank you, I’ve updated and expanded my free urge meditation giveaway. I’ve created two audio meditations plus a brand new workbook that will teach you a different way to respond to the urge to drink. The meditations are super simple. All it takes is five minutes and a pair of headphones. And each one now comes with a follow-up exercise in the workbook to help you dig deeper and really retrain your brain when it comes to the habit of drinking. So after you leave a review on iTunes, all you need to do is head on over to rachelhart.com/urge, input your information, and I’ll make sure you get a copy of both meditations plus the workbook in your inbox.